Once Upon A Time Review: “Last Rites” Are Read, But For Whom? Before the two-hour season finale next week, Once Upon A Time delivered some serious blows in this week’s antepenultimate installment (technically, because there are two episodes next week). It seems as though, instead of introducing a new villain or story for next season, our heroes (or what’s left of them) may be facing adversaries that are already quite familiar to them. But I guess we’ll have to wait and find out, huh? What a heart-breaker this episode was, wasn’t it? *insert crying face emoji*. Once Upon A Time will be looking to cap off what has been a stellar season, and the lead in episode was a strong one. This week on Once Upon A Time: An escaped King Arthur, murdered by Hades, lands in the underworld, and helps Hook find what he needs to help Emma stop Hades. 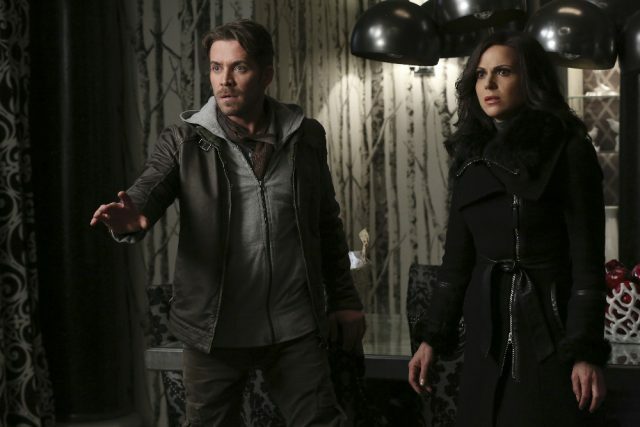 Above ground, Robin and Regina work to convince Zelena that Hades is playing her and needs to be stopped. Emma, Snow, Charming, and Henry all work above ground to stop Hades. Rumplestiltskin tries to make a deal, first with Belle’s father, and then with Hades. Hades deals a devastating blow. Hook receives his reward. I found this episode to be heart-wrenching, sad, and exciting all at the same time. I wasn’t expecting the Hades conflict to come to a head so soon, but I’m glad it did. I’m certain that the conflict isn’t finished resolving, as there will be unresolved feelings, especially about the upcoming two spoilers I’m about to mention, so if you haven’t watched look away in 3…2…1. Hades murdered Robin Hood, and Hook was rewarded for his role in Hades’ demise by being returned to Earth by Zeus. Now, I was pretty sure the show wasn’t going to kill off two characters, and rumors have been swirling for some time that Sean Maguire was leaving the show. But, the show was able to present all this in a way that was still surprising and believable, and watching all of it go down sure was heart-wrenching. Robin’s death was in the worst way. He was protecting his child and the woman he loved from Hades’ wrath. I was suspicious that he would be the one to go for some time, but that didn’t make it any less hard to watch. The funeral scene was nothing short of heartbreaking, especially seeing Roland put an arrow on his father’s casket. But, perhaps what really caused my tears to flow was the previously undone naming of Robin and Zelena’s daughter. Who has now been aptly named: Robin. Though a little strange, it was both beautiful and a heartfelt moment from the show. It was a fitting farewell to a character. I’m glad that Hook has returned, but I’m afraid of the fallout. Of course, Emma got what she wanted and Regina and Zelena are both heartbroken. I love the Killian Jones character, but I wouldn’t have been mad if two characters had departed this season. Mostly, the stakes would’ve been higher for Emma AND Regina going forward, and honestly, this show has too many characters. But, I’m happy with the way it turned out, and there was a nice emotional payoff for Emma and Hook. I don’t think she’ll be taking him for granted again. I get the feeling that lovesick Rumple and Regina will be returning to their villainous ways in the near future. What’s great about this show is that no one is truly a villain, and their motivations are not always clearly black or white. Gray areas are some of my favorite things to explore, and I’m excited for the show to move in that direction. Surely, of course, these characters will one day get what’s coming to them, and the optimist in me hopes that those endings will be happy. What did you guys think? Are you upset about the bait and switch? Are you sad about Robin? Let us know in the comments!